তার উষ্ণতা ও আন্তরিকতায় আমার বুক ভরে উঠে ছিল। ডাক্তার এসে গেছে চেকআপের জন্য, আমাদের বিদায় নিতে হবে। সালাম করে আমি ও গাজী বিদায় নিয়ে বেরিয়ে এলাম। বুকের মধ্যে গেঁথে নিয়ে এলাম দরবেশতুল্য এক মহামানবের অমূল্য দিক নির্দেশনা। সেটাই ছিল মওলানা ভাসানীর সাথে আমার শেষ সাক্ষাৎকার। এর অল্প কয়েকদিন পরেই তিনি ইন্তেকাল করেন (ইন্না লিল্লাহি ওয়া ইন্না ইলাইহি রাজিউন)। তাঁর মৃত্যুতে জাতি হারাল একজন জনদরদী অভিজ্ঞ মুরুব্বী এবং দূরদর্শী-বিচক্ষণ নেতা! 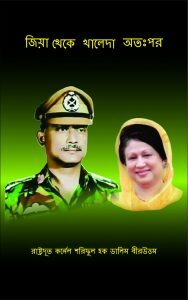 selfless concern about the life and death issue of Bangladesh and its people. To reveal his political wisdom and deapth of his thoughts in view of historical facts I, deemed it appropriate to pen down the gist of the meeting he held with the writer. At the end of seventies he had travelled to London for a complicated surgery. After Zia’s DGFI failed to get me back to the country from China I had been living in London. Maulana came to know it and had asked me to meet him through my childhood friend Ghaziul Hassan Khan. Ghazi was then living in London permanently working as a free lance journalist as well as running his own press at East London. At my insistance he agreed to publish a Bangla news paper which I named as ‘Desh Barta’. We both were then working hard day and night to launch ‘Desh Barta’. One day we both went to a flat in West London arranged by the Bangladesh High Commission, where he was staying under post operative care. Issues concerning Bangladesh very frankly in a cordial atmosphere. point of time Zia had already created a situation where we and Sena Parisad were having serious difference of opinion about his treacherous activities and nefarious anti people political initiative. Details had been written in ‘Ja Dekhechi, Ja bujhechi, Ja Korechi’. I was thinking, should I tell everything to Moulana. Maulana had spontenuously supported the revolutionary uprising of 15th August. He had also held a press conference supporting the political change and fall of Mujib’s dictaroial one party rule in no uncertain terms. There after one day I took Genarel Zia in cognito to Shantosh for introducing him to Maulana and seek his blessing. I am aware that Zia is now trying to maintain a distance with you all. Zia at his own is moving in a wrong way. On my return I shall make him to understand that. If he gets my point then fine or else I know what to do. You all remain ready to be back in the country. Now my son, listen carefully to what this oldman would say. The job that you all have started the end of it is still far away. You can’t efford to be ostrich within the present boundary of Bangladesh. You got to look beyond the boarder. You must think deeply about this otherwise Bangladesh will turnout to be a land factured into pieces. Hujur, do pray for us so that Allah gives us opportunity and Hikmat so that we can dedicate our life for the country and the down trodden people as you have envisioned. But most unfortunately a few days after his return this Darvish left this world. With his untimely departure we lost a great visionary and leader of of the timing millions downtrodden people. May Allah rest his soul in eternal bliss at Jannat e Ferdous Ameen!